You know I love all of you, right? There’s just one thing I wanted to mention. Just something I noticed. I am one of the 62% who wash their hands after using the bathroom. That number always seemed low to me, because I see people wash their hands around here. So I figured it was men, lol. And I would quiz my sons about it, did you wash your hands? Is this against the man-code? So…where are this 38%? Um….from what I saw on my trip to Delaware/Pennsylvania, they are on the East Coast. It’s not only that people don’t wash after going to the bathroom, it’s also that the handwashing facilities are lacking. 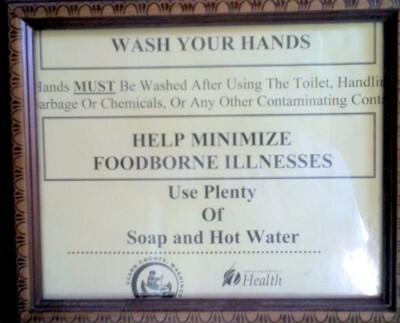 You have to really want to wash your hands and put considerable effort into it. At the Willowgrove walmart in PA, I must have spent 10-5 minutes standing at the sink attempting to get enough soap, then enough water, to actually wash up. And, while the Willowgrove walmart was the worst, the problem was systemic to almost all East Coast public bathrooms. In the age of Swine Flu (and I was visiting an infant to whom I did not want to spread any kind of disease) leaving the bathroom without washing (and I saw you do it!) isn’t going to help. I have a solution. I think probably water is an issue. I also think that remodeling all East Coast bathrooms so that they actually work is probably cost prohibitive. 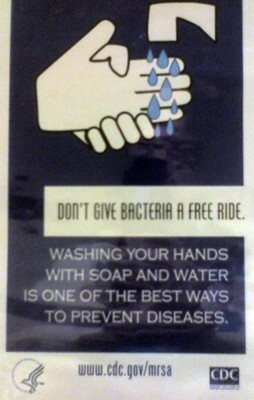 And, it seems people have given up on handwashing anyway. The people are busy and they rush right out of the bathroom as if they couldn’t get out fast enough. So. We live in the age of Swine flu? Well, we also live in the age of Purell. I suggest we solve the problem by adding Purell dispensers. Put them near the door so people can pump some up on their way out.